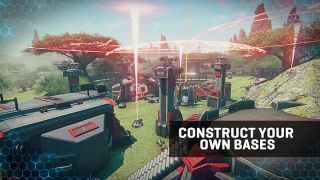 You can now build bases in Planetside 2, and that sounds like a fine thing to be doing on a Saturday afternoon. It's all thanks to a new mineral, Unobtai...sorry, 'Cortium', which allows players to cobble together a load of new vehicles, tools and other objects, super quickly. "But how does it work?" you totally just asked me, through your computer. Thankfully, the official Planetside 2 website has the answer. "Players can summon an Advanced Nanite Transport (ANT) at any vehicle terminal. ANTs are 4-man transports that have mining lasers for harvesting Cortium nodes, which are scattered around the map. The ANT can be deployed at any time, which will reveal access to a building terminal from which you can equip and then place fortifications (at a cost to Cortium)." It all sounds a bit RTSy, doesn't it? Meaning it might be time to amend Planetside's generic acronym. What was formerly an MMOFPS is now an MMORTSFPS. Just rolls off the tongue, doesn't it?